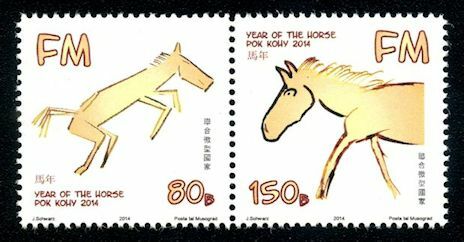 Commemorative Issue "Year of the Horse"
Issued to celebrate the "Year of the Horse", following the Chinese tradition, with inscriptions in Mandarin, English and Musogradian. 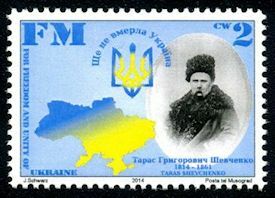 Commemorative Issue "Ukraine - Taras Shevchenko"
Issued to celebrate the 200th Birthday of the Ukrainian writer Taras Shevchenko, founder of the Ukrainian national literature, and to support Ukraine in their fight for freedom against the Russian aggression. Funds collected by selling this stamp were donated to provide the Ukrainian Army with first aid kits. 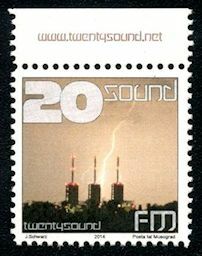 Issued to document the launch of the first Musogradian international radio station, twentysound which is dedicated to the Classical Music of the 20th and 21st century. Issued to celebrate Towel Day, May 25th, a day where fans of the author Douglas Adams remember him by carrying a towel with them all day. Issued to document the visit of a Musogradian delegation to Bretagne. A sheet of the "Bretagne" stamps was donated to representatives of the local Stamp Collecting Society in Locmariaquer, Departement Morbihan, Bretagne, during a stamp exhibition dedicated to Bretagne. 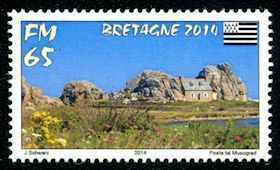 The stamp shows the "House between the Rocks" on the "Cote du granite rose". Issued to remember the Musogradian settlement history in Australija. 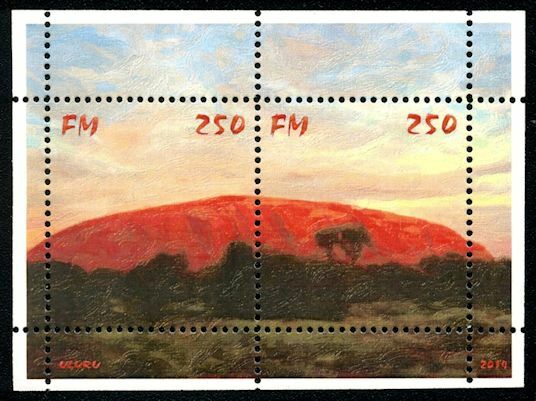 The miniature sheet shows a painting of the holy monolith "Uluru" in the morning light, by Robert Bilak, a painter of mixed Musogradian-Yolngu ancestry. 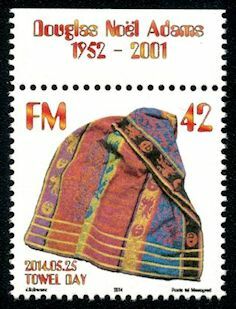 The miniature sheet consists of two stamps. It is the first issue printed on glossy paper after it became available again in 2014, being out of stock since 2012. Commemorative Issues "Air Force and Independence Day"
Two issues with the same motive (mirrored), the first celebrating the Musogradian Air Force, and the second one Independence Day, October 3rd.. On both stamps. a PA502 "Thunder" with Musogradian ensigns is depicted. The issue is the last one showing the old Musogradian flag with red background. A replacement stamp with the new flag was planned but not issued as the old one is still used as Flag of the Musogradian Armed Forces. Commemorative Issue "New Flag of the Dershowo Musograd"
Issued to celebrate the new National Flag which was introduced by the Dershowo Musograd on 2014.11.15, replacing the red background with gold to avoid any mixup with the flag of the Russian Irredentists in Ukraine. Gold was selected as symbol of purity and economic sovereignty. The two larger stamps (CW 1.25 and 2.50) were printed in one sheet, with 8 stamps of each value, creating 2 se-tenant pairs per sheet. A smaller version (CW 2.00) was printed with an Air Mail appendage. Issued to celebrate Christmas, a festival transcending religions and cultures. The two se tenant stamps and the miniature sheet with English and Balanda texts show motives from the Botanical Gardens in Balangrad City.